Super absorbent microfiber towel for your dog. Soaks up to 20X MORE water and mud than other Shammy towels. Dries dogs 8X FASTER than a cotton towel or blow dryer. 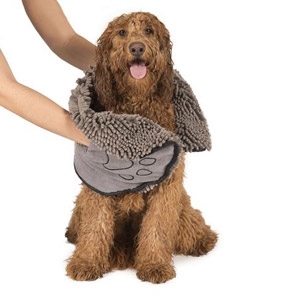 Massages your dog while drying! Dual hand pockets with elastic allow for a better grip when drying! Easy to wash. One size fits all: 13 x 31 inches.